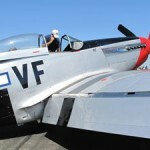 The 2nd Annual Wings and Wheels was a great success last Saturday; a good sign that this event is here to stay. There were so many aircraft and automobiles to see that I could hardly get through them in the four plus hours that I was there. Flybys kept everyone running to the sidelines to gawk at whatever was making a pass, cameras madly clicking away before the crowd dissipated again. There was no shortage of exciting sites but I think many would agree that the highlight of the day was the P-51 Mustang; the iconic WWII fighter. 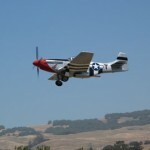 The P-51 arrived in late morning and was greeted by an enthusiastic audience. There were 16,766 of these planes made by North American Aviation, starting in 1942. Today there are only about 250 left and fewer than 150 that still fly. The owner, Terry Tarditi, purchased the plane from David Gilmour of Pink Floyd and currently keeps it in Stockton. There were definitely expressions of awe as people watched the plane taxi to the gas pump, then get pushed into its parking spot. I heard whispers of “fastest propeller plane ever” and “best plane ever made”. Another person remarked “can’t believe he lets anyone get near it”. When the plane got ready to take off again around 1:00pm people were congealed for a good twenty minutes, waiting patiently, watching, waiting a bit more, and watching. It took off with our resident Soviet Yakovlev training plane; American and Russian allies united again. As the planes took off to the north and gradually disappeared from view there was a collective sigh of disappointment. They didn’t do any flybys. The crowd broke apart and everyone went back to the show. I was queued up for the bathroom when, out of nowhere, the planes went screaming past. They made an impressive sight. The P-51 was powerful and smooth. I scrambled for my camera. They made several more passes; just far enough apart that we’d thought they’d gone for good each time. As I was getting in my car they made their final flyby, the P-51 gently rolling as it whirred overhead. It was an exhilarating end to a fun day. 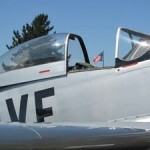 To better appreciate the P-51 Mustang in its historical context, watch this video; the story of an 88 year old WWII ace reunited with his plane 60 years after the war. It is humbling. 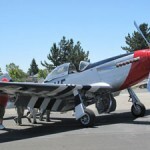 More Wings & Wheels photos can be found on the Backyard Traveler Facebook page. Thanks for your great article about our Classic Wings and Wheels. 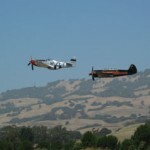 The Petaluma Area Pilots Assoc (PAPA) is working to keep the dream of flight alive for everyone in the Petaluma area. 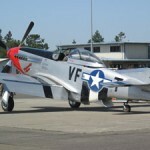 Your coverage and description of the aircraft, especially the P-51, are wonderful. The video link to the story of Jim Brooks was produced by Chris Woods whose brother and wife are tenants at Petaluma Airport. Scott Woods owns a classic WACO biplane, red with black trim, that was on display on Saturday. Thanks again for your articles. This one and the one in the PD on 7/22 are a great service to our airport and everything we’ve worked so hard to achieve at our little piece of aviation heaven we call Petaluma Municipal Airport.